dungeon when it’s pouring. 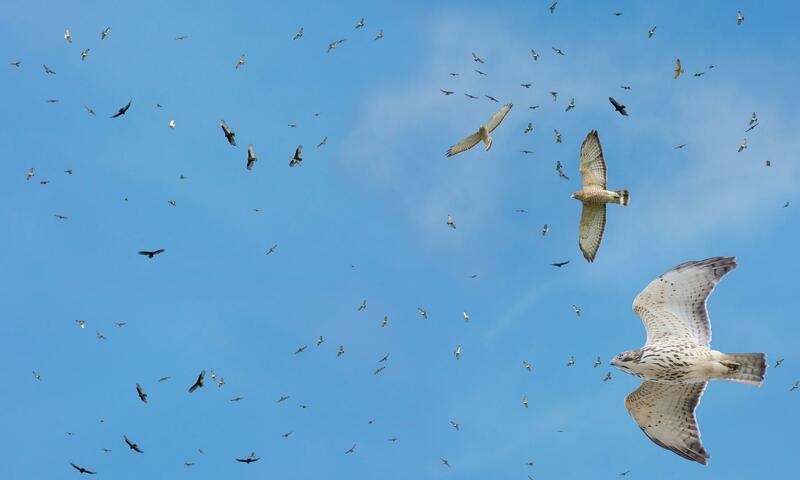 We had seen the forecast for Sunday and I remember remarking to Denise, on one of by trips upstairs to the world of the living, that I bet Sunday was going to be a big day for migrating hawks. The middle of September is traditionally a good time for migrating broadwings across the mountains of Western North Carolina. Any birds moving south would certainly have been waiting on weather Saturday – then good skies and a tailwind Sunday should make for a good push. There was still writing to be done Sunday and I got up early and returned to the dungeon. By early morning sunshine was peaking through the windows and concentration was escaping. I broke for a big breakfast with the girls and slipped out to the deck to get a look at the first day of autumn. I plodded back downstairs but it was clear, the muse was struggling to get outside. Around two o’clock, the girls were heading to violin lessons and Mom had a few errands to run. I followed my muse to the Blue Ridge Parkway. The entrance to the Parkway from US 74 is about five minutes from my home. I knew I didn’t have time to make it to Caesar’s Head, in South Carolina (probably the most productive hawk watch in the region) or even down to the Mount Pisgah watch along the Parkway. So I just headed north on the Parkway looking for some sky. I stopped at Steestache Bald Overlook around mile marker 438.9. After about 20 minutes of glassing the north-northeastern horizon, I noticed two dark shadows zooming through the valley below me in a southerly direction. Because of the distance and the lighting, a positive ID was out of the question – but they were definitely streaming raptors. I kept my binoculars on them and suddenly they turned upwards and began to circle. Other birds quickly joined them from the shadows of the valley. A loose kettle of at least 35 birds formed and went up and over the Parkway at a point (as the hawk flies) about a mile or so north of me. Now, in all honesty, there was no way for me to positively identify those birds other than a kettle of raptors. But I’m assuming they were broadwings. I hung around for another 20 minutes or so and decided to head up the Parkway to where the kettle crossed over and see if I could find a better vantage point. There were a couple of places where one could see a lot of sky to the north-northeast but no good pullouts. I drove on to Grassy Ridge Mine Overlook at mile marker 436.8, thinking I would turn around and look for a spot along the shoulder to pull off on the way back down. Well, some Blue Ridge Parkway traveler must have gotten so excited about the view from the overlook that they dropped their big gulp soda cup right in the middle of the parking lot – unable to make it the 50 feet to the trash bin. I walked over, picked up the cup and turned around to take it to the trash bin. When I turned around, hawks by the dozens were erupting out of the valley across the Parkway and beginning to kettle over my head. This was not the largest kettle of hawks I have ever seen but it was the closest. I had birds circling, like cartwheels in slow motion, only a couple of hundred yards (or closer) to me. It was difficult to get a count initially. They were too close to glass with the binoculars and they were wheeling in such tight circles it was hard to keep track. Birds continued to join them and they continued to climb in the thermal above me. They gained altitude and began to stream off to the south-southwest and I could get a better count as they streamed out of the kettle. I counted 85. I couldn’t stay long, but a little later a single osprey came over in nearly the same pattern. Hopefully, I’ll be able to spend more time at Grassy Ridge Mine Overlook.